Candid, full length view of husband and wife Russ and Joy Lillie wearing military uniforms. They are outside standing in front of an automobile. Joy is wearing an Eisenhower jacket and pants that are tucked into boots. Russ is wearing a shirt and pants that are tucked into boots. Title by cataloger. Russ and Joy were high school sweethearts. Russ volunteered for the service before Pearl Harbor and spent most of his military service stateside. Joy graduated from nursing school in 1942 and joined the Army Nurse Corp in 1944. 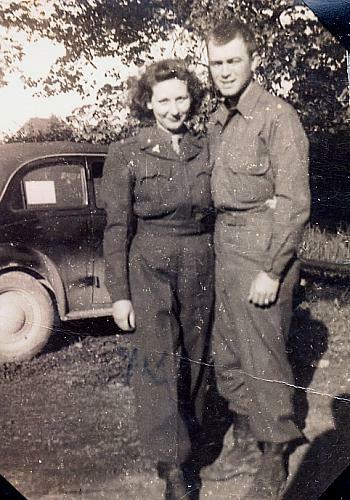 She was assigned overseas and went to Europe in 1944.